We should admit from the start that we are mixing Santa traditions rather more loosely than perhaps we should. Especially given the rich array of characters in the Dutch/Flemish traditions, where you have Sint Niklaas (St. Nicholas) and Sinterklaas, both associated with the holiday celebrated on December 6th. Sinterklaas is arguably the origin of Santa Claus (after he was reinterpreted in the U.S.), but according to Dutch tradition lives in Spain. Other figures are Kerstman (who delivers presents around Christmas, and thus more like Santa Claus) and Kleeschen, which is a tradition largely limited to tiny Luxembourg. We're sure that we'll be told how we messed up the characters, but for now we're throwing them all in, plus for a little excitement we're tossing in Zwarte Piet (the guy with the switch/whip). 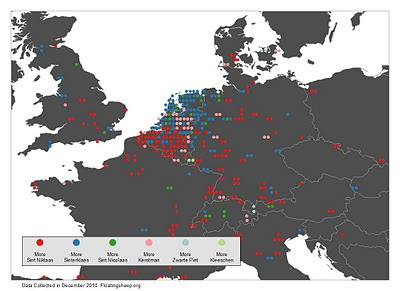 As in Germany, there seems to be a North/South split with Sint Niklaas being more prevalent in Belgium and Sinterklaas more prominent in the Netherlands, with a thin buffer of Kerstman references in between. Hard to know what exactly is going on, but Sinterklaas does seem to be more of a Dutch thing and poor Kleeschen can't seem to escape Luxembourg. More interesting is that this region seems much less preoccupied with the "bad guy" of the season, which in this case is Zwarte Piet. There is only one spot in the Netherlands that has more references to him than anyone else. A bit surprising but perhaps it is tied to him not being nearly as scary as some of the other "bad guys" out there, such as Krampus. For an extremely funny interpretation of the Sinterklaas and Zwarte Piet tradition, which we highly recommend, see David Sedaris' monologue in text and on audio.